Create a warm, inviting ambiance Philips LED light bulbs provide a beautiful, warm white light, an exceptionally long life, and immediate, significant energy savings. With a pure and elegant design, this bulb is the perfect replacement for your frosted traditional bulbs. Save further with the Philips LED multi-packs. who has that many screw type bulbs in theri house? Me. Multiple bulbs per light fitting, multiple fittings per room, multiple rooms in house. Me. Multiple bulbs per light fitting, multiple fittings per room, multiple …Me. Multiple bulbs per light fitting, multiple fittings per room, multiple rooms in house. This fitting (Edison Screw E27) is the main fitting used in the US and Europe, so it’s no wonder it’s cheaper and gradually becoming popular here. Seems to be the main fitting sold in Ikea these days. This fitting (Edison Screw E27) is the main fitting used in the US and …This fitting (Edison Screw E27) is the main fitting used in the US and Europe, so it’s no wonder it’s cheaper and gradually becoming popular here. Seems to be the main fitting sold in Ikea these days. Yeah I noticed this too. Speaking of Ikea is this cheaper than their lights (which are pretty cheap)? 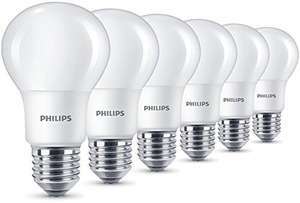 Not sure if the newer Phillips bulbs are better but the 9w ones I bought in 2016 are complete crap, bought 6 of them and 3 of them died in about a year. I have 24, although they are the smaller SES fitting. 7W it does not mean more efficient. It just means less powerful. Why don't they do more 100 watt equivalent LED's? They always seem to be 40 to 60 watt. Please Mr Philips the Lightbulb Men, make some brighter ones. Why don't they do more 100 watt equivalent LED's?They always seem to be 40 …Why don't they do more 100 watt equivalent LED's?They always seem to be 40 to 60 watt.Please Mr Philips the Lightbulb Men, make some brighter ones. Not sure if you are just being pedantic but, filament LEDs give out the same lumens at 7w as older type LEDs give out at 9 or 10w. The osram filament LEDs I mention are 806 lumens, same as the Philips ones. So the Osrams are more efficient. And they have them in BC fitting too. Not sure if you are just being pedantic but, filament LEDs give out the …Not sure if you are just being pedantic but, filament LEDs give out the same lumens at 7w as older type LEDs give out at 9 or 10w.The osram filament LEDs I mention are 806 lumens, same as the Philips ones. So the Osrams are more efficient. And they have them in BC fitting too. I was not sure what sure what lumens are you talking about. I wrongly assumed that you thought 7W will be better just because it is less. does this mean our plug sockets will be changing too as Europe's and US's are different? does this mean our plug sockets will be changing too as Europe's and US's …does this mean our plug sockets will be changing too as Europe's and US's are different? No. Screw bulb fittings are becoming more common here because they are common across the EU and US. There is no standard for plug sockets and UK plug sockets are far superior than EU or US ones - though more expensive to produce due to additional safety features.